Ithamar had progressed far enough in his career to unlock a couple of new social interactions. One of them, ‘talk about astrology’, comes with this pretty hologram. After a couple of nights in the new house, I realized that the moodlets associated with the unstable trait do in fact trigger in the future, but only if your sim sleeps in a normal bed. 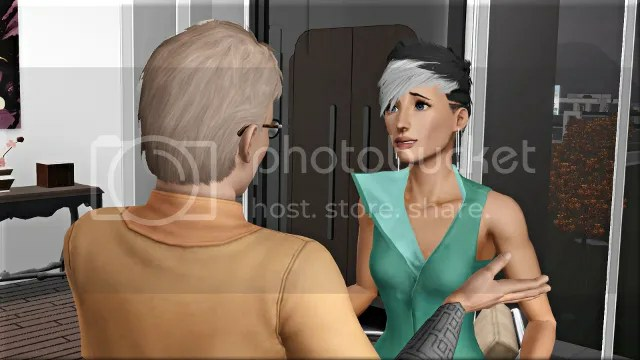 Annoyingly, when Lavanya’s ‘episode’ arrived she just lost a trait again rather than having one replaced, so I sent her to the hospital to cure her. I like Lavanya but I haven’t really known what to do with her this generation, since her unstable trait hasn’t been having quite the effects I expected. To allow myself to focus more on Mira and Ithamar’s careers, I decided to move her out. 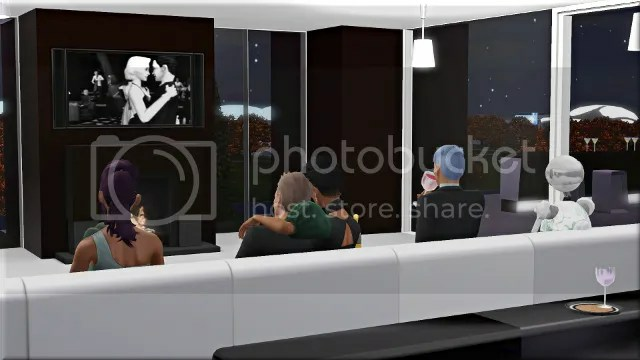 The vanilla Edit Town doesn’t let you split up the active household while you’re in the future, but Master Controller does so I was able to put her in this house with a group of young, sociable sims. 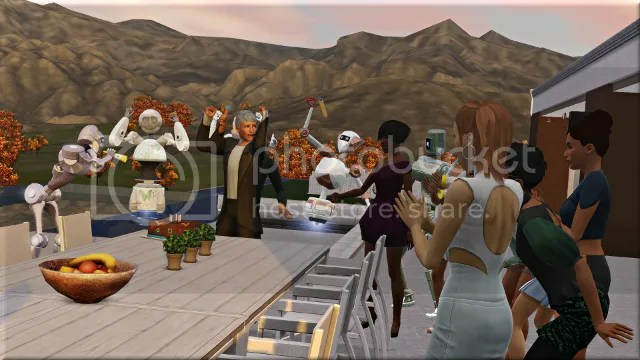 There’s not a whole lot actually to show off with the bot arena or observatory careers, but when Ithamar’s birthday rolled around I did have him invite all of his and Mira’s co-workers to the house for a party. Edwin ended up staying the night. 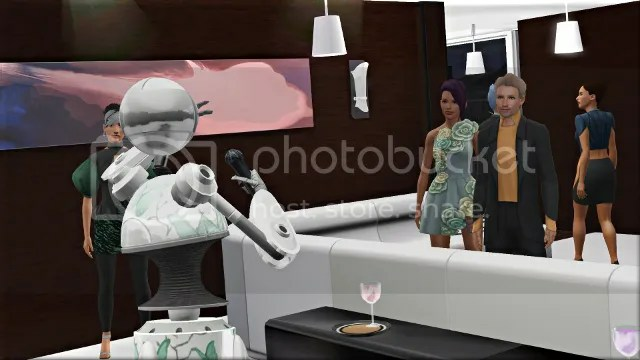 The next day, I tried to have Mira transform into her bot disguise to enter a competition, but the option was grayed out. The explanation was clear: she was pregnant. Now was definitely the time to move Edwin in. He was easy enough to find – still hanging out at the house, napping on Ithamar’s bed. I decided to move Chelsea in too. The next morning, the couples enjoyed synthesized servings of her favourite dish, french toast. During the course of Mira’s pregnancy, both she and Edwin wished to get married. 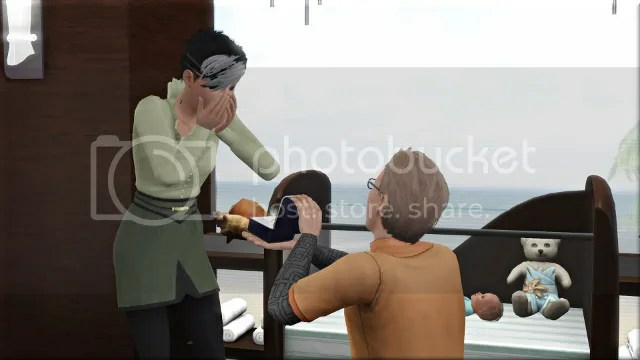 I sent them to the restaurant for a romantic dinner. Why am I so bad at working out when my sims are going to go into labour? Maybe if I made sure they were well rested before, my sim mums wouldn’t always look so grumpy. Anyway, meet our final EP legacy baby, Arjan Archibilt-Patel. With their little boy tucked up in his crib, Edwin got down on one knee and Mira did her best to look surprised. 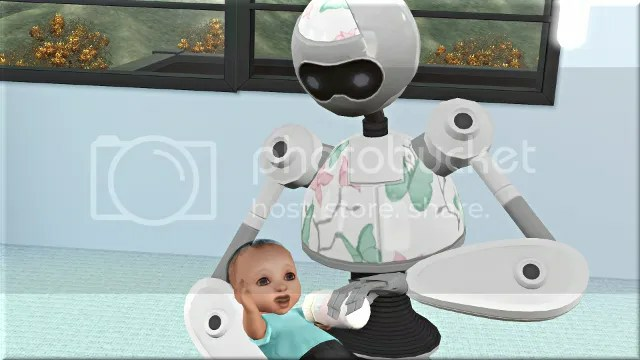 I swapped robotany gardener out for robo nanny so that 5.0 could help out with the baby. Mira introduced him to her sister and mum. A few days later, she and Edwin were married in the legacy park. A wedding seems like a nice place to end this generation and this legacy. I hope you’ve seen enough! It’s probably unfair to compare Into the Future to the other expansion packs, because it was the only one I hadn’t really played before, but I did enjoy getting to grips with it. 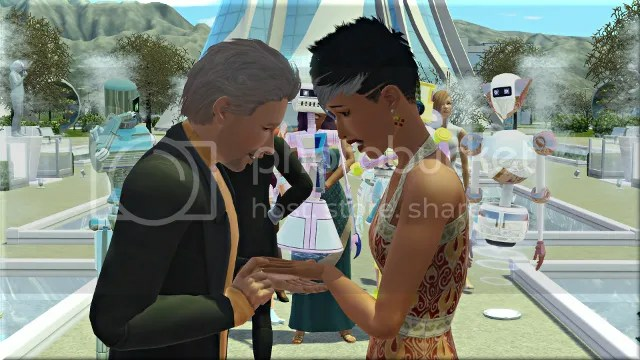 In general I think that the central time travelling mechanics – switching between different versions of the future, meeting your ancestors, and so on – aren’t handled particularly consistently or well, although of course the beauty of TS3 is that you don’t have to play the way the designers intended so that doesn’t actually matter too much. I will certainly continue to use pieces of future tech in my builds, and I also look forward to revisiting nanites and bot building now that I understand how they work. 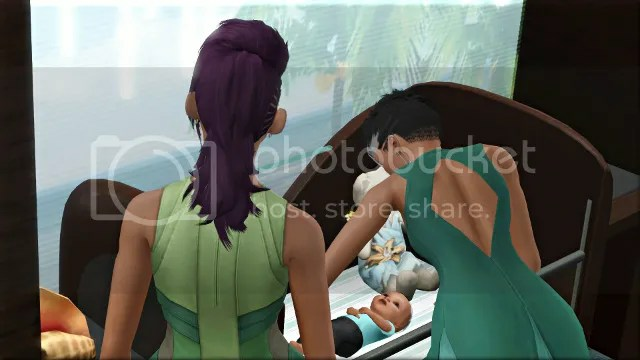 Oasis Landing itself was totally free of lag for me, probably because it’s so small, and I would be interested in creating a family to live permanently in the dystopian version of it at some point. Playing this family over twelve generations has been quite an eye-opening experience, and lots of fun too. I’ve loved having the opportunity to explore features that I might not otherwise have considered. I feel that I now have a much better understanding of the way all the different activities and venues work, which should make me more adventurous with my builds as well! 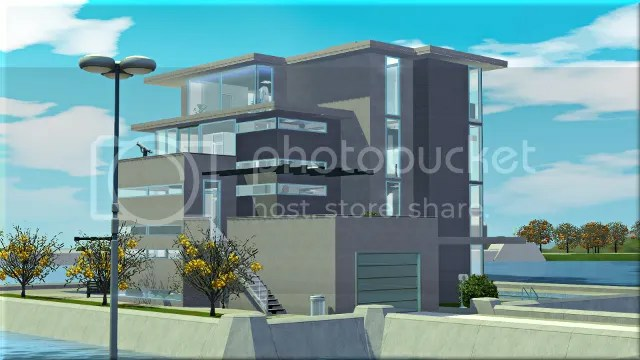 I haven’t made any cfe tutorials in a while because most of them take me a long time, but one on sloped ceilings shouldn’t be too much work to put together. Was there a particular build of mine (or alternatively a real life inspiration picture) you’d like me to use as an example? That’s perfectly understandable! It takes me a long time when I’m just fiddling around with it, and i’m not even that good at it. I think that the ceilings in the Annan household look great. 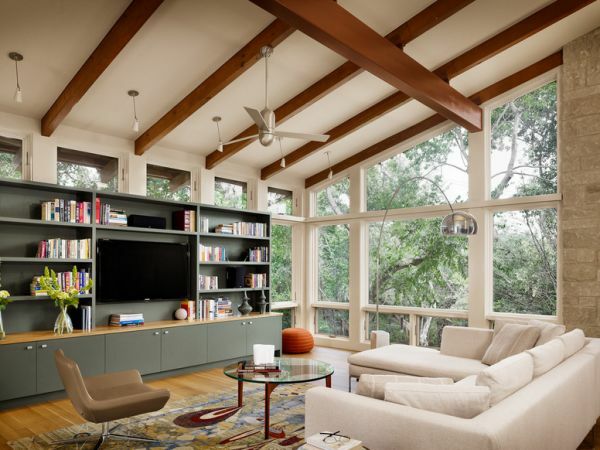 Or for a real life picture something like this: http://cdn.homedit.com/wp-content/uploads/2014/02/Slanted-ceilings-living-room.jpg would be awesome. 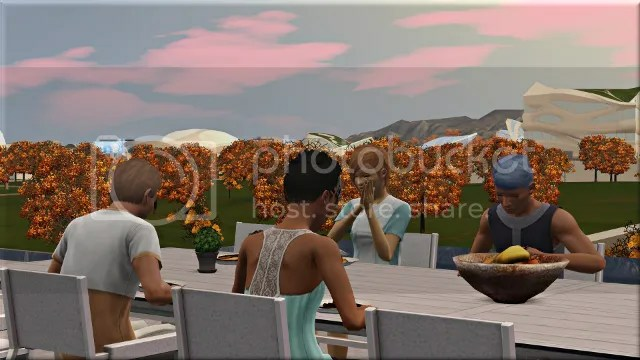 I have really loved reading through your EP Legacy – it’s been great to see so many of the EP features showcased alongside your beautiful builds and sims. There were so many features I hadn’t explored – and I still have a big long list of them to work through! It’s really inspired me to try out different things in my game, and I even bought the Supernatural EP because it looks so lovely in your EP 🙂 No regrets with the purchase – even if i’m not playing supernatural sims I love all the CAS items, vintage furniture and the extra harvestables and meals. I’m finished?!?! Wow. This has been an awesome legacy. I’ve realised how much I’ve missed out from some of the EPs! Haha. I’m going to have to explore some of them a lot more, especially SN. 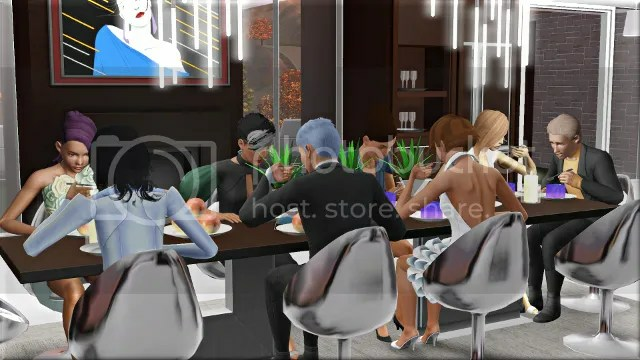 I found I skipped over a bunch of the life-state experiences and things because I mainly bought it for the clothes and furniture! 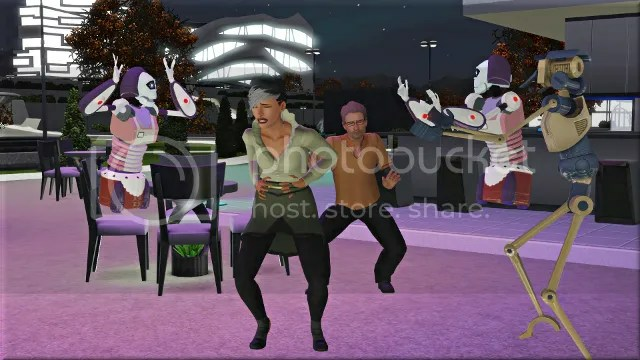 All of your sims are so beautiful, too.